Me with our two guides in front of the train bount for Beijing. It's great to see the new layout and webpage. Nice work! As I am half-Taiwanese (and half-West-German) the case against visiting North Korea was strong. But now I am glad that I took the trip. One can never understand the Koreans from what we hear about their country every day. They are really nice people and even though their version of history and politics is absolutely different, we still need to remember that if we want to achieve more openness in their society we need to visit their country and show them that we, as Westerners, are not "evil". I can only strongly recommend anyone to visit the DPRK! 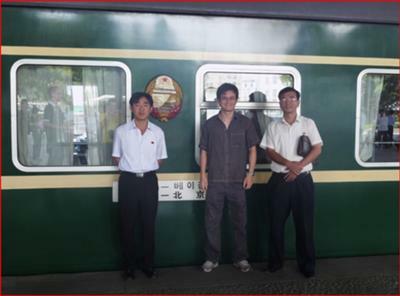 It's an experience of a lifetime and with the guys from KTG you will probably get the best price offered compared to any other travel agency for the DPRK.